… and why prospective college students should ignore the rankings. 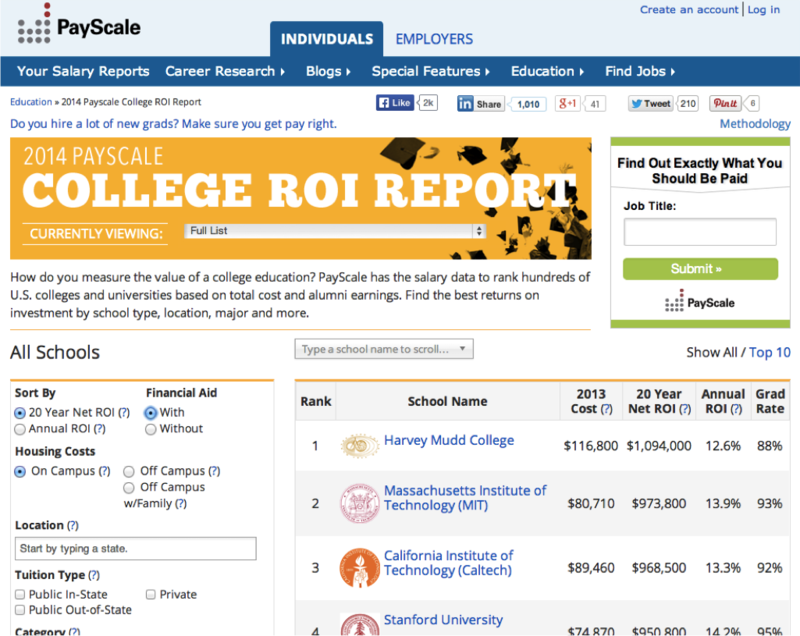 Payscale.com comes out with a yearly ranked list of the colleges that produce the highest-paid graduates. My and Kyle’s alma mater, Harvey Mudd College, has topped the list (some permutations of it, anyway) for the past few years. And while I love that Mudd gets nationwide press coverage every time the new rankings come out, I don’t recommend that prospective college students use them to choose where to attend or even to be “useful for high school seniors evaluating their likely financial return from attending and graduating college,” as PayScale claims (source). Even if you think that future earnings is a legitimate way to discern the value of a college education (very dubious), the PayScale college rankings are kind of B.S. – it is very difficult to separate how much of the ROI is due to the value-add of the college and how much is due to the interests and abilities of the entering student. These rankings tell you what kinds of graduates go on to have high-paying careers, and I’ll argue in this post that Mudd happens to have a lot of those types of students in comparison with the other ranked schools. You can read PayScale’s full methodology if you are interested, but basically the 20 year net ROI is the expected earnings of a fresh graduate over the next 20 years minus the cost of the education (with or without financial aid), based on surveys of what graduates from the last 20 years have earned. The rankings are interactive so there are ways to play with the list, such as limiting to colleges with certain qualities like “religious” and “research.” You can also look at ranked ROIs for certain groups of majors granted from different institutions. Even if you’ve never heard of Mudd, you probably won’t be surprised by some of the other top-10 schools: MIT, Caltech, Stanford, and a few Ivies. The qualities that make Mudd highly ranked often apply to these other institutions as well – Mudd is apparently just the most extreme case! 1) Mudd only offers science and engineering majors. PayScale’s definition of an engineering school is “Any school which grants more than 50% of their undergraduate degrees in math, physical sciences, computer science, engineering and engineering technology majors.” The only majors Mudd offers are biology, chemistry, computer science, engineering (general), mathematics, physics, and a few combinations thereof such as mathematical and computational biology (source). Basically, Mudd doesn’t offer any of the majors that tend to bring down the expected earnings of graduates the way that most large universities do. It’s not even a fair comparison. 2) The students who attend Mudd are top-notch. I won’t bore you with all the statistics, but Mudd has a very impressive resume for its incoming classes in terms of SAT/ACT scores and high school valedictorians and so forth – like many other selective institutions. My point in this section is related to the one that Zac Bissonnette makes in Debt-Free U: students who can gain admission to selective colleges are going to do well whether they attend the selective colleges specifically or other ones such as in-state public universities. (While I won’t go as far as Zac does to say that where one goes to college doesn’t matter, I will say that it’s hard to tell what value the college is adding and what is intrinsically present because of the qualities of the admitted student body.) The corollary to this argument is that colleges who admit only highly qualified applicants will naturally do well on the Payscale rankings. It’s not a useful way to judge the value of the college education specifically. 3) Payscale selects for top-paying Mudd majors. Since two-thirds of Mudd graduates go on to attend graduate school (source), the Payscale data represents only one-third of the alumni! From my own observation, the science and mathematics majors go on to get graduate degrees at a much higher rate than the engineers and computer scientists. Of our close group of seventeen friends from college (disproportionately composed of science majors), eleven have or are pursuing doctorates and one is pursuing a master’s. The majors of the remaining five? Three engineers, one computer scientist, and one physicist. It’s not at all a coincidence that engineering and computer science are the fields that have the least degree inflation of the majors offered; you can still get a high-paying job in one of those fields with just a B.S. I think that Mudd’s 20-year ROI is so high because not only does Mudd only offer majors in higher-paying STEM fields, but the Payscale methodology further selects for high-paying careers such as computer science and engineering by eliminating data from students who go on to get graduate degrees. 4) Mudd is in a high cost-of-living area. 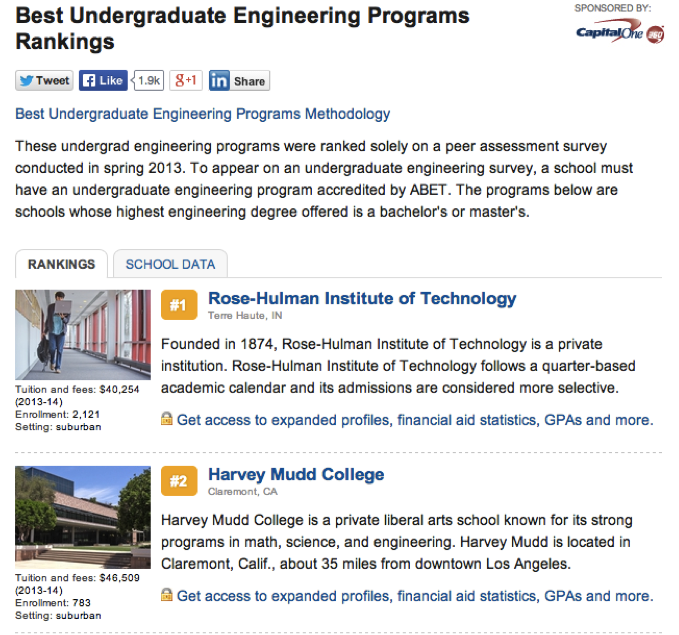 Rose-Hulman is another college that has a very similar profile to Mudd’s. In the past few years, the two colleges have been trading back and forth the top spot in US News & World Report’s ranking of the best undergraduate engineering programs (in truth, Rose-Hulman is usually ahead). But there is one major difference between Rose-Hulman and Mudd that I think would account for a great portion of the expected earnings differential of the graduates (#1 vs. #12 with financial aid): their locations. Mudd is in a very high cost-of-living area (California) and Rose-Hulman is in a low cost-of-living area (Indiana). They each have strong regional pulls for their entering classes, and I think it’s reasonable to assume that many graduates stay somewhat local for their careers because of the stronger regional reputations of the colleges, the networking opportunities with alumni, and that the students tend to already be rooted in the West vs. Midwest. The higher salaries associated with high cost-of-living areas, which are not accounted for in the PayScale methodology, surely have an impact on the lifetime earnings of the graduates (we are not talking about net worth!). Every one of the top ten ranked schools is in a high cost-of-living area. Lest you think that I’m not proud of my alma mater, I’ll state clearly that I think that Mudd offers a superior education for a very specific type of student. I just don’t think that earnings are a sufficient way to judge what a degree from a certain school offers a student. And if you do want to look at earnings, you should get much more granular and control for all of the factors I’ve mentioned here (and probably more). What differentiates Mudd from other STEM undergraduate educations is not necessarily found in the future earnings of the graduates. I see two major academic attributes that make it unique (or close – there is another college that is modeled after Mudd in many ways). What that means on the ground is that a very high portion of the curriculum (approximately one-third of total courses) is devoted to the humanities, social sciences, and arts. Students must also declare a “concentration” of four courses in one thematic area. I really appreciated that I could keep a balance between my primary interest in the hard sciences and my appreciation of the disciplines usually neglected at engineering schools. 2) Mudd is an undergraduate-only institution. It might be the case that these attributes contribute to Mudd topping the PayScale rankings, but I think that’s far from evident. I do think these are attractive points for the right type of applicant, and that these types of attributes are far more important for prospective students to learn about than expected future earnings. I think if you want to have a meaningful discussion about potential future earnings, it’s more helpful to look at specific majors, perhaps from specific institutions. But I’m not sure what percentage of students end up majoring in what they intended to when they entered college – I was confident enough to commit to Mudd’s limited selection of degrees, but took until the end of my third semester to choose between physics and engineering. That students don’t know what they want to major in from the start of college is probably part of the temptation to look at colleges overall, but that confuses the issue considerably. I’m pleased if the PayScale ranking gets Mudd more attention from prospective applicants, but I hope they delve much deeper into what the school offers than just looking at this headline earnings number! * I think it’s ridiculous that PayScale eliminates people with graduate degrees from their data. Just because you go on to get more training doesn’t mean that your undergraduate degree has no impact on your career. The simple fact that your undergraduate education prepared you to go to grad school or helped you get into a better grad school will affect your career earnings, even if they are mostly dependent on your graduate degree. Professors I interviewed with at several universities brought up their positive view of Mudd’s graduates, including one who told me he preferred to hire graduates of liberal arts colleges. Putting all the emphasis on where you got your terminal degree also implies that people do not grow or change at all after the completion of their degrees. I would think that landing a job with a company committed to employee development does as much for your career in certain fields as graduate school does in others, but those people are still kept in the data. Did you consider future earnings when choosing your college or major? How do you take PayScale’s rankings and methodology? What role do you think your undergraduate institution played in your career if you also have a graduate degree? Is “Live Like a College Student” Good Advice? 25 Responses to "Why Harvey Mudd College Tops the Payscale ROI Rankings"
I hadn’t realized you were a Mudder. I had a good friend from high school and a couple others head to other Claremont colleges. I think Payscale’s analysis isn’t perfect, but at some point you just have to set a methodology and use it as a basis of comparison. My high school is sometimes excluded from criteria of the “best in USA” lists despite outperforming many of those at the top of the list because students need to test to gain entry. But then they’ll change the criteria and it’ll be back in the top 10. I would say that consistency and limiting the ability to game the system (ie – criteria on alumni giving is EASILY gamed by some colleges) are probably the best ways to improve these kinds of analyses. This is the first time we’ve revealed it explicitly on EPF! I have had one person guess it in the past. My HS is also selective so I’m only aware of the US News public list – probably links to the ones that exclude it don’t get passed around among alumni because we wouldn’t be on it! It depends on the purpose of the ranked list whether it would make sense to exclude selective schools. I don’t know why anyone bothers to rank public HSs nationally since you don’t have that much control over where you attend! I know there was a regional list compiled by the newspaper in the area I grew up that my HS was footnoted in, but that sort of makes sense because you could get in no matter where you lived. I guessed Harvey Mudd as soon as you said liberal arts college for engineering and private school (I don’t remember how long ago this was), but then again I am in CS and have heard over and over again about how they improved the gender ratios in their CS major. I also figured out your grad school pretty easily, though I forget how. Maybe it’s just the only one I know of in that state and it turned out to be a good guess! Close reader! Yes, Mudd has much more national visibility now in comparison with when I started because of Maria Klawe. What they’ve done with the CS major and the overall admission stats with women is remarkable. If I remember correctly, of the 40 CS majors in our year only 2 were women (plus a couple Scrippsies), and our class overall was about 35% women. But it actually would make the school less attractive to me if I were applying today – I wanted a highly skewed gender ratio. I talk much more frequently about our current university, obviously, so that one is easy to figure out though I don’t write the name. You really don’t need to know anything more than that we live in Durham! You know, a while ago I realized that I had assumed I knew what city you live in but that you’ve never actually said it on your blog. Is that a privacy thing and if so is it more for people you know, people you don’t know, or your employer? I’ve never heard of this school, but that’s only because I’m in Canada and only really know a few of the big named schools in the US. I’m quite curious why you wanted the highly skewed gender ratio? It’s not just because you’re Canadian! When I decided to go to Mudd almost no one I ran into (on the East Coast) had heard of it, so I got a lot of “Harvard Med? ?” and “I’ve never heard of that!” and “Is that a community college?” Thankfully now there is much higher awareness in science and engineering circles and in academia. 1) Socially, I prefer the company of men over women – very much so at that time in my life but still now to some extent. (I also tend to like girls who have the same preference.) My close group of friends from freshman year of college onward was five guys and me, plus my (female) roommate somewhat. Looking back, it also made dating a lot easier. “The odds are good, but the goods are odd” was a saying at both Mudd and my high school, which also had an unbalanced gender ratio so it was what I was accustomed to. I’m glad I capitalized, so to speak, on that time in my life in finding Kyle, because now that I’m in a biology-related field the gender ratio is more balanced. I also believe I “married up” (or to put it in HIMYM terms, I’m the reacher and Kyle is the settler) – possibly the dearth of available women at that time was a contributing factor. 2) I think that I was somewhat using the gender ratio (which is one of a small set of stats available for all colleges at the time in those compilation books) as a stand-in for an ‘engineering school,’ or at least a school that had a lot of people in science and engineering majors. It would be the kind of school that had a lot of graduates going in to traditionally male-dominated fields, which is what I wanted to do. That doesn’t fully make sense because larger universities have different schools within them, so the overall gender ratio might be balanced while the engineering school’s was off, but I didn’t really appreciate that at the time. You show a picture of the warts, of course someone is going to figure out it’s Mudd. It’s a pretty distinctive building. The top graduate school in my field also graduates the largest % of women (of the top 10 schools). They can get the best people and since they have the most women they attract more women applicants, which increases the size and quality of their pool overall. The engineering program my sister went to also had a better female ratio because it had a reputation for not being full of sexist asshats and having support, which meant more women making it to the end which meant attracting more women applicants. Completely the opposite of our flagship state school’s program. My department is close to half female, which is also crazy, but the quality of our applicant pool, especially the women applicants, has been just sky-rocketing over time. Having women in a male-dominated field seems to attract really high quality women who do high quality work and then don’t leave because it’s hard to find a working environment where you’re not the only woman (thus not responsible for representing your entire gender). Nicoleandmaggie recently posted..Ask the grumpies: How to deal with 9 month salaries? I’ve been racking my brain to remember when I included a picture that included warts. Can you point me to it? The ones I remembered are actually of the newer buildings that either don’t have warts or they weren’t directly in the picture. Great explanation of the reason for promoting diversity. Mudd’s been doing well on the women front recently but is still pretty dismal on race and socioeconomic class as far as I can tell. The analysis is flawed, but they have to come up with a methodology to evaluate the pay across schools and I suppose that’s what they come up with. You see the same in MBA pay rankings as well – Wharton students have historically gotten the highest pay out of MBA (higher than even HBS or Stanford) because a majority of them go into finance, and finance pays the best. Well Heeled Blog recently posted..Konnichiwa Japan! Well, they don’t have to. I’m still not clear on what the purpose actually is, except to make people like me get a big head. That is interesting about the MBA rankings. I suppose it would be better to just look at the earnings from the specialty you want to go into – do most people know that going in? Do they break that out within individual schools, like the way PayScale (sort of) does with majors? My alma mater likes to boast that it has great graduates, but I really do think that a good portion of that is its selective admission criteria! It admits only great students, so of course they’re mostly going to do great coming out. I actually had no idea that I was going into a lucrative career when I applied to colleges. I just liked computer science! What a great analysis Emily. I’d seem this site but is taken it for granted that the authors knew what they were song. That’s crazy that they don’t include folks who go on to get another degree. It also lends a ton of credibility to your analysis that you graduated from the #1 school. Including people with graduate degrees probably makes their analysis far more difficult – would they still do the first 20 years or the 20 years after the terminal degree? But it would be more realistic. If they included graduates who went on to earn graduate degrees, it’s possible that the salary might even be higher, no? It depends on what the grad degree is in I guess. I don’t put too much stock in pay rankings. I know for law school, there was a bit of controversy because the reported percentage of graduates employed with 6 months of graduation. But they didn’t care whether you were working at McDonald’s or at a law firm. Also, with salaries and employment data, it was based on surveys from graduates. If you’re unemployment or working at a low paying job, might not have incentive to return that survey. Andrew@LivingRichCheaply recently posted..Is it REALLY Okay to Take Paternity Leave? The methodology actually states that only FT employees are included in the survey, so it might even exclude a lot of people (i.e. women) who keep part-time schedules, which would inflate the earnings. But you are right, if you have a low-paying job that might be disincentive for returning the survey. I think it’s a bit better to report the salaries than the employment right – just as you said, it’s easy to rig the employment rate. The mid-career salaries for people with grad degrees might be higher, but if they are looking over only 20 years the earnings so far may be higher for the BS graduates. I’ve been earning like $25k/year for 7 years and won’t get a bump until I finish my PhD, so it’s easy to see how many of my engineer peers will still have me beat at age 42, even if I’m able to surpass them later (definitely questionable). I definitely did not go into my field for money. However, the thing about my industry is it’s easy to pivot later on. My university is not very prestigious as it only recently gained university status, but it is THE institution for media/comms and so while people in, say, law and engineering might look down on it, it’s hard to argue with our employment rates. That’s a big drawback of the PayScale rankings, at least the part I talked about – it judges the entire school, even if there is one standout program.